How One BlackBerry Survived A Dunk In The Water! Acck! 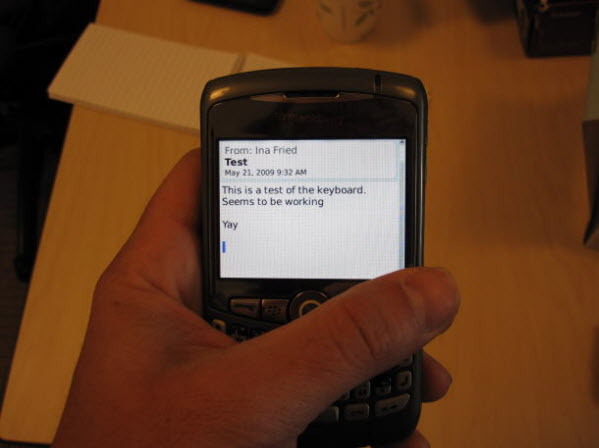 Every BlackBerry owner has had bad thoughts of this happening or maybe you even had it happen! Dropping your BlackBerry in the toilet is never a good thing to do. Actually forget the toilet, just simply liquid period is never a good thing but over at CNET writer Ina Fried tells us her tale of the brave little BlackBerry that just would not quit, even after a a dip in the proverbial pool. I saw signs of life, but it was clearly not working properly. Sometimes the power light would go on and nothing else. Other times it would show the rotating hourglass, but the screen was not back-lit. The time without my BlackBerry was unsettling. To be away from the computer is one thing, but to not check my e-mail every few minutes was unnatural. On the bus ride home, I occupied myself with Yahtzee Adventure on my iPod Touch. As soon as I got home, I quickly logged into Outlook Web Access to see what vital messages I had missed on that 30-minute commute home. I tried to pretend it was no big deal. To get the full story you'll have to head on over to CNET and read it all, it's a touching story and shows that just when you think your BlackBerry is down and out, there's still hope it can come back kicking and screaming!